For a couple of years we’d been fantasy house buying in France. It started when a friend of ours, Chris, found a website listing property for sale in France, this site provided hours of amusement for Chris and me. We’d meet our friends at the Bull & Butcher pub in Akeley, with a print out of whatever outrageous chateaux we’d found that week and spend the evenings daydreaming about what the six of us would buy, living an idyllic life as some sort of middle-aged commune. The addiction then moved onto Living France magazine, and every month we’d go through the property pages with a fine toothcomb. We’d decided, years ago, that we wanted to end up in France, and the plan was to try and realise this by the time John was 50 – the target date was 2012. John had a Eurostar booking that he hadn’t been able to take the year previously and we needed to use it before it expired. Work was pretty busy (and as we work together time off was quite rare) but we needed to use the ticket, so we booked Saturday to Thursday as holiday, and decided that we’d take our MK2 Jaguar for a really decent run through France down into the Dordogne. And just for the fun of it, we arranged to see 5 properties located in the Charente and Deux Sevres, purely to give us a feel for what you could get for your money. Friday night down at the pub – Andy says, jokingly, don’t do anything rash like buy a house. Our plan was to head down to the Dordorgne and stay in Logis’ (great hotels) en-route to Brantôme on the river Dronne, and work our way back up to Sauze Vaussais in Deux Sevres. I’d planned the route meticulously, had all our hotels booked, worked out how long it would take to get to each one, and allowed time for a relaxing drive through the French countryside. 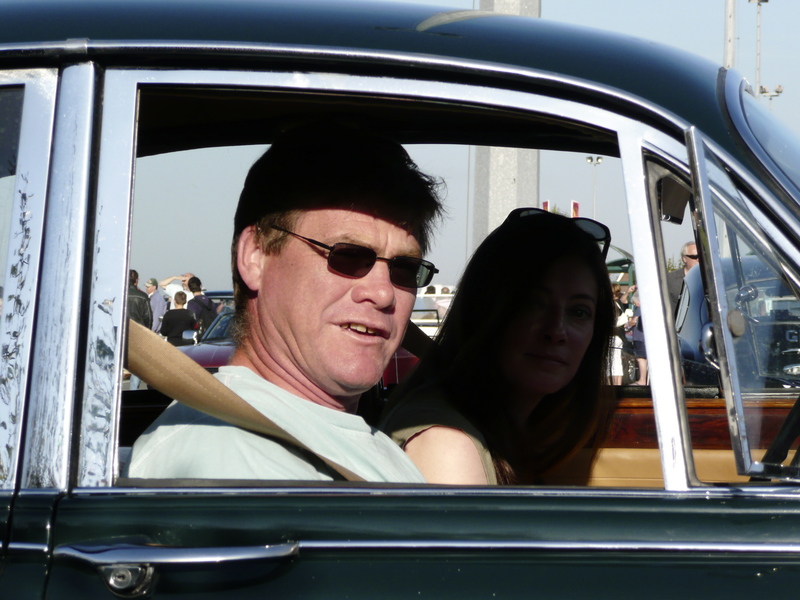 We got off the Eurostar in glorious sunshine, the Jag was running beautifully, a great start to our short break. At least another 2 hours were spent on the hard shoulder trying to explain to the insurance company that we couldn’t move the car, no we couldn’t poke a hole in the glass to see, why couldn’t a tow truck just pick us up. All they could tell us was to get to the nearest garage… Meanwhile cheery lorry drivers hooted their appreciation of such a lovely car, a very kind, young French couple slewed to a halt, reversed up and asked if they could help out and it was getting hotter. Mid April and the temperatures were amazing, just a shame we couldn’t really appreciate it at the time. The insurance company managed to find a garage to take the car to in Neufchatel en Bray and had booked us into a hotel for the night. John finally gave up with trying to get a tow, bundled me back in the car and we had the most terrifying drive down the dual carriageway, into Neufchatel, through the busy streets, just as everyone was heading home for their Saturday evenings. It was like watching the world through some crazy kaleidoscope. The garage took the car in, we found the hotel, checked in and then found a bar. I managed to call and cancel that night’s Logis booking. Such a shame it looked lovely, and we were really looking forward to staying there. Determined to kickstart a sense of holiday we splurged on an expensive dinner at the hotel, and decided to book for Sunday night, so we could find out on Monday what would happen with the Jag. Bum! They were closed on Sunday, so we were to be out after breakfast, nowhere to stay and no car. The insurance company were very helpful. They arranged for us to pick up a hire car, and the Jaguar was going to be taken to a specialist in Rouen to fit a new windscreen. However, the only place we could pick up a hire car on a Sunday, was Charles de Gaulle airport, in Paris – two and a half hours drive away… The local cabbie couldn’t believe his luck. It was going to be a long drive, but we were not going to cancel another hotel booking, so we rang the hotel in Brantôme, said we’d be arriving later in the day and set off, no chance for a scenic drive through the countryside – we shot off down the AutoRoute stopping only for petrol and a wee. The hotel in Brantôme (Hostellerie du Périgord Vert) was lovely, and it was warm enough for dinner outside on the terrace. The owners were a young French couple, the food was fantastic! Monday morning we set off to meet our first Immoblier (estate agent) in Riberac, we took a minor road that ran along the river Dronne. What a great choice, it was the most stunning drive through what had been the original route of the river, carved through the rock face, sort of a semi-tunnel, with the river running down to the right of us. It was so green and leafy, every now and then a beautiful watermill would appear, and high up on the opposite valley was an incredibly old fortress, a beautiful drive and totally relaxing. The first property we went to see, on first impressions, was very Grizzly Adams! Set in woodland, with lots of paths meadering through, a charming duckpond and a swimming pool. Unfortunately the house just didn’t do it for us, it was far too small. The three gîtes were just too basic, we would want something with a bit more character. The second property he took us to see was just outside the market town of Chalais. At first glance it was lovely, a blue and white 18th century house set high on a hill, very chocolate box. The gardens sloped down the hill to a pool, it had two gîtes. Unfortunately the owner had forgotten we were coming to view so there was no chance to look inside the house! We did get to look around one of the gîtes which had been left open, the rest we just had to peer through the windows at. Bear in mind that through all of the remainder of the week, John was continually on the phone to insurance companies and the repair garage in Rouen, trying to organise a replacement windscreen to be shipped from the UK, a specialist to be found to fit the windscreen, and explaining that it wasn’t an option to leave the Jag in an unknown location somewhere in the city off Rouen. How would we get home anyway? Oh, and I’d forgotten to mention that we were down on our belongings as we’d had to leave a bunch of them in the Jag, and just hoped they would still be there when we were reunited with the car! After the two viewings we went back into Chalais, which is charming, and the huge market was just clearing up, such a shame as it looked like a really promising one, and we do love wandering around them. We found a bar and sat in the sun watching the stall holders clear up, and suddenly the place was so quiet – lunchtime! We found a tiny restaurant, I think there were us two and a very old couple of gents in there. Then it was a drive up to Angoulême to pick up the N10 to Chaunay, where we were staying at the Hôtel Central. Tuesday we set off to meet the Immoblier in Sauze Vaussais. Off we set with Howard, he drove us cross country through all the pretty little communes, fields and woodland, I was totally in love. The house was in the middle of a small village, and had a driveway that ran down the side of the churchwall, this opened into a private courtyard with the most enormous horse chestnut tree in flower – gorgeous. He showed us the two gîtes first, which were being sold furnished, and they were lovely, one, a barn conversion and very modern in style, open plan, all on one level. The second was a cottage attached to the main house, all flagstone floors, beautifully restored walls and an enormous fireplace. The garden was huge with a big vegetable patch, surrounded by a mix of low drystone walls and natural hedging. The main house had been recently renovated, with an impressive gallery leading around the first floor. 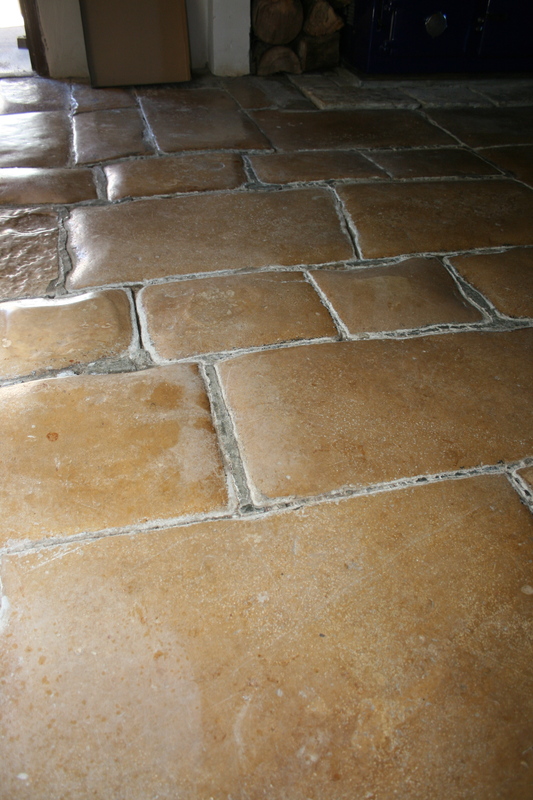 The rooms downstairs were huge with the original flagstone floors, but perfect living space for the two of us. Charming place, it just felt right. Howard then took us off to see another house with three gîtes. On the way, we told him that the farmhouse was just what we’d be looking for, it ticked all the boxes with all original floors and a lot of features. He obviously picked up on this as he said we probably wouldn’t be keen on the next one. Location-wise it was lovely and the main house looked beautiful from the outside. The garden was mature and there was a decent –sized pool surrounded by wooden decking. However, all the original features had been ripped out and internally it was very 70s with dreadful stone fireplaces replacing the original big sandstone ones and lino flooring. Again, the gîtes were a disappointment. There would have to be a complete redecoration of the main house and the gîtes, and it would have become an obsession to look for original features to put back in the house. Too much work and money! We said bye to Howard and that we’d be in touch. We now had to sort out what was happening with the Jag. We were booked into a hotel in Rouen, and due to collect the car the following day. All the way up the autoroute we were talking non-stop about how blown away we were with La Ferme de L’Église and let’s go for it! It felt right, we absolutely loved the house, the area was perfect, let’s for once make a mad decision! Couldn’t call Howard as the day was spent fielding insurance calls, spent the evening in Rouen, which was lovely and I’d like to go back and have more relaxed time there. Thursday morning, finally tracked down the garage with a cabbie, and met Monsieur Resposible who took John through the work that had been done. The fact that this had been turned around in 3 working days, in France, and with the screen coming from the UK was unbelievable – I think they were all pretty impressed with themselves. We called and left a message for Howard saying that we wanted to make an offer on La Ferme, and headed back home. We got a call back from Howard to say that someone had pipped us to the post, it had been on with another agent – and the offer had been accepted the day before. Oh well, we were pretty disappointed, but we really hadn’t gone to France to buy a house, only to look. Hey, at least we knew what we wanted to look for in the future. Off we went to the Bull & Butcher to find a blown up photo of the Jag’s shattered windscreen mounted above the fireplace!